According to the U.S. Environmental Protection Agency, yard waste such as leaves accounted for more than 13 percent of the 250 million tons of garbage that Americans put in landfills in 2008. Although you may be tempted to just get rid of leaves by disposing of them in your garbage, especially when they begin piling up in the fall, use a composting holding unit to compost them quickly and efficiently into a nutrient-rich soil amendment for your vegetable garden or potted plants. Composting leaves fast requires that you regularly turn your compost and monitor its moisture level. Collect your leaves and other organic matter rich in carbon and nitrogen. Compost requires carbon-rich materials (usually brown ingredients) such as dead leaves, straw, old hay, shredded newspaper and cardboard. Good sources of nitrogen include fresh grass clippings, fresh green leaves, cow manure and fruit or vegetable peels. According to the University of Illinois Cooperative Extension, you’ll need about ¼ to ½ of your compost volume to be nitrogen-rich materials. Keep the carbon ingredients separate from the nitrogen ingredients. 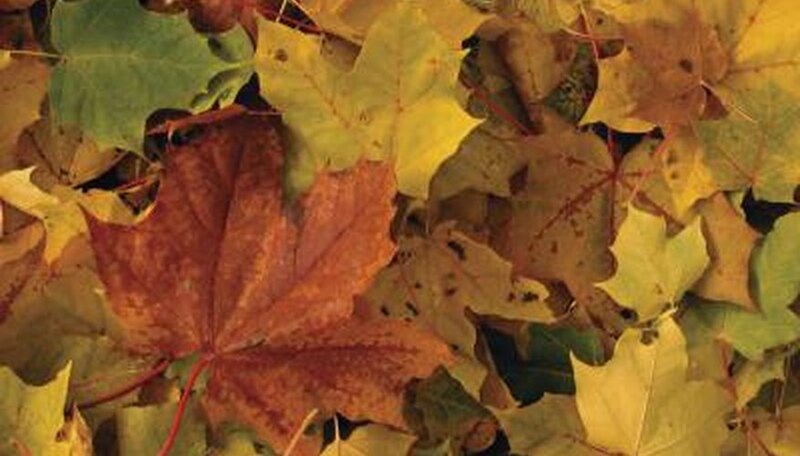 Layer your leaves with other organic materials in your compost unit. Mix the carbon-rich ingredients together and spread a 2- to 3-inch layer across the bottom of your composting unit. Put a 2- to 3-inch layer of nitrogen-rich materials on top of the carbon layer; add a 1- to 2-inch layer of topsoil to introduce decomposing microorganisms to your compost unit (these microorganisms live in topsoil). Mist the layers lightly with your garden hose and repeat the layering process until the bin is full. Check the moisture level in your compost bin. The ideal moisture level for composting microorganisms to do their work is slightly damp (about the consistency of a wrung-out sponge). If the compost is too wet, add additional dry leaves to soak up the extra moisture. If it’s too dry, spray the compost lightly with your garden hose to add more water. Don’t forget to mix the compost layers with a manure fork when you add additional leaves or water. Maintain your compost. Wait three to four weeks to allow the compost to heat up, then mix the layers together with a manure fork to promote adequate aeration. This introduces additional oxygen to your compost, which helps the microorganisms decompose it more quickly. Repeat this process every four to five days, adding new leaves to the compost when they become available; your compost bin should produce finished compost within about 8 to 10 weeks. Mix your leaf compost into the top 2 or 3 inches of your vegetable garden soil to promote your vegetable plant growth.